As a member of both the '80's premier guitar band RACER X and later, million sellers MR. BIG, Gilbert has gained reputation as being one of the most melodic, but powerful guitar players in the rock arena. Determined not to be pigeon-holed as just a "shredder", Gilbert's solo work has allowed him the opportunity to exercise his deep appreciation for the more song oriented side of rock music. Paul has been releasing many successful solo albums in the past years which confirmed his position as one of the premier rock guitarplayers in the World. “Get out of my Yard” is his brandnew 2006 CD and his very first all instrumental album!! It most definitely is all that you would expect from a guitarist of Paul’s caliber and stature. 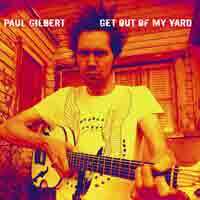 “Get Out of My Yard” is one of the top guitar albums released to date: ferocious, intense, over the top and mindblowing.